Lovely sterling silver honey bee hanging from a 2.5mm snake chain. The standard length is 45cm, please let us know if you require a different length. The bee is approximately 2cm x 3cm. Lovely 9ct rose gold honey bee hanging from a 1.9mm snake chain. This necklace is also available in sterling silver and rose gold vermeil, please choose from the drop down menu. The standard length is 45cm, please let us know if you require a different length. The bee is approximately 2cm x 3cm. Pretty and delicate sterling silver poppy necklace with 18ct gold vermeil detail. The size of the poppy is approximately 1cm in diameter and the curb link chain length is a standard 45cm, please let us know if you require a different length. See also poppy stud earrings to match. Pretty little hand made sterling silver bee on a delicate sterling silver chain. The bee is approximately 1.5cm x 1cm and the chain length is a standard 45cms, please let us know if you require a different length. 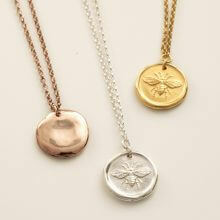 Wonderfully tactile sterling silver or gold honey bee relief pendants hanging from a pretty diamond belcher chain. These stunning hallmarked pendants would make a lovely gift and are available in sterling silver, 18ct yellow gold vermeil and 18ct rose gold vermeil. If you were interested in solid gold, please let us know. The pendant is approximately 15mm across and the diamond belcher chain is a standard 45cm, please let us know if you require a different length. Pretty and delicate flower necklace. The flower is approximately 2.2cm wide and is sterling silver with 18ct gold vermeil detail and hangs on a delicate silver curb chain. The standard length is 45cm, please let us know if you require another length. A beautiful necklace made of small sterling silver links with distressed gold vermeil beads strung on a strong sterling silver snake chain. The necklaces comes in 2 lengths, 38cm or 41cm, please specify on the order. Matching bracelet and earrings. Unique personalised sterling silver letter necklaces with your birthstone set in a small silver heart and a small round diamond set in the letter if required. Also available in gold and platinum. All made to order, please contact us for more details. Prices in silver start from £75. Charming and delicate little silver or gold vermeil bee hanging from a diamond cut trace chain. The standard length is 45cm but can be adjusted if required. A simple solid sterling silver and gold vermeil (hallmarked) heart strung on leather. Also available in silver. Each heart (approx 1,7cm height) may vary slightly as they are individually hand made. Can be tied to any length.